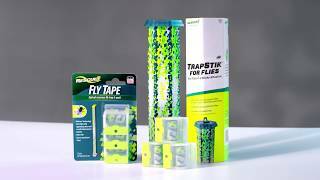 The RESCUE!® Fly Tape catches common nuisance or filth flies. This isn't your grandfather's sticky, gooey brown fly ribbon. RESCUE!® Fly Tape uses VisiLure® technology to ensnare flies with appealing colors and a multi-dimensional pattern. Flies are attracted to the tape, then get stuck to the adhesive surface. The flies get attached to the sticky surface and… well, they stick around for good! 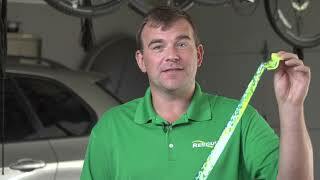 Use RESCUE!® Fly Tape anywhere around the house, indoors and out - wherever flies are a nuisance. A thumbtack is provided to attach Fly Tape to a ceiling, wall, frame, post or other surface. I have used other fly traps on my patio that didn't do as good a job as the Rescue Fly Tape. I have dogs that use the patio for elimination. I also live in a Desert climate. The tape has managed to catch the flies very effectively even in the hottest heat of summer. My husband and I live in a rural area. Because our neighbors board horses, we tend to be visited by a lot of annoying flies during the warmer months. One area that always has flies in it is our garage. Up until now, you would always see a bunch of them buzzing around in there. But not anymore!